I was feeling pretty confident. 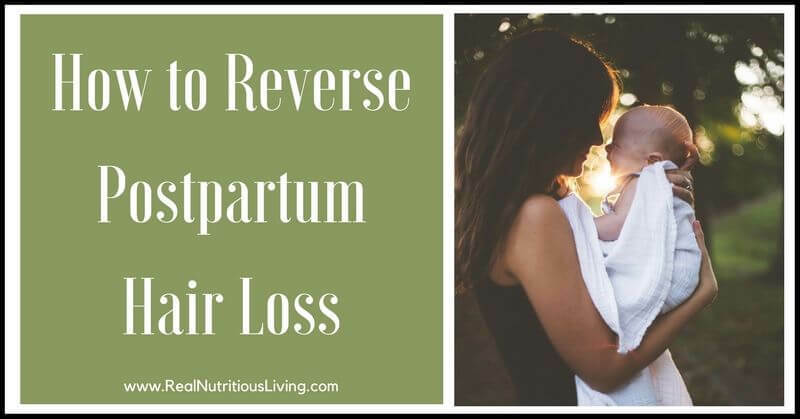 I was four months postpartum and no hair loss. My strands were still thick, long, and luxurious. This is the very least a new sleep-deprived mama deserves, so naturally, I was not very happy when I started losing globs of hair at a time. The signs started with extra hair on my pillow, losing more in the shower, and my husband complaining there was hair everywhere. First, I want to reassure you, there is good news. This phase is temporary. Do not lose heart, you’re not going to lose all of your hair. I remember feeling like I would and even in the age of Google, the resources were completely lacking. I needed to know what the hell to do NOW! Normally, around 85-95% of your hair is in the growth phase at any point in time, but the hormonal changes during pregnancy stimulate an increase in the percentage of hairs in the growth phase and less ‘shedding.’ This is why our hair feels so thick and amazing when we’re pregnant. Once baby is born, we have hormonal changes and a larger number of hairs than normal enter the resting phase. Since the resting phase is followed by hair shedding, it’s normal for new mothers to experience greater than normal hair loss. 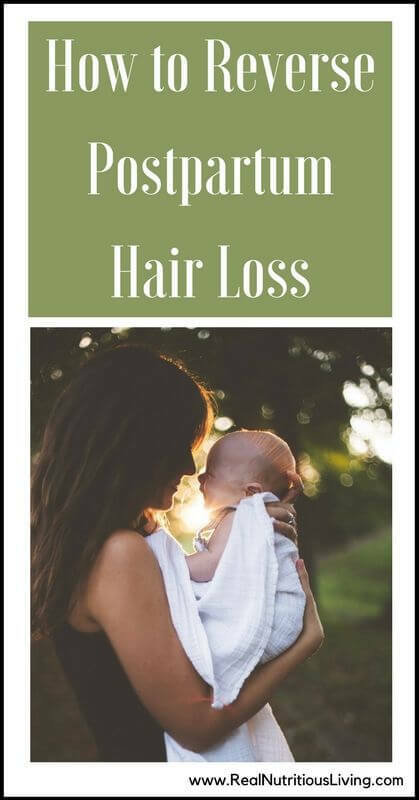 Average onset is typically around three months for postpartum hair loss, although it can occur anytime between one and six months. Hair loss can seem more extreme if your hair grew much more than normal during pregnancy, or if you have long hair. Most women will return to their usual hair growth cycle within six months. In my research, I learned breastfeeding is not supposed to be linked to hair loss, but whenever my son nurses more (teething or high-need phase), I’ve noticed a higher rate of hair loss. Take a postnatal supplement: Once the baby is born, our bodies have different needs, which is why I was so happy when I discovered a postnatal formula. We need food fermented iron, vitamin B6, vitamin D3, and iodine for breastfeeding and healthy hair. Bonus: My energy picked up and I was able to cope with stress better once I switched from a prenatal to a postnatal formula. I used and still take these. 2. Eat fish or take fish oil: Include plenty of high-quality fat in your diet. If you’re not including wild, fatty cold water fish three times a week, take a high-quality fish oil (like this. See discount note below). These nutrients will keep your hair strong and promote growth. 3. Use Biosil twice daily: By increasing the amount of collagen in the blood vessel walls, BioSil increases the “elasticity” of capillaries. This ensures an abundant flow of growth-rich nutrients that optimize the keratin production in hair, meaning this is formula will give thicker, stronger, and shinier hair from the inside out. Get Biosil here. 4.Switch to Safe: It’s important you’re not using toxic, hormone-altering chemicals on your hair (or body) when you’re hormones are already trying to find balance post-baby. Furthermore, the chemicals in many conventional hair products will also further damage your hair (source). Limit washing and products as much as possible. Use only safe shampoo, conditioner, serum, and spray. Make dry shampoo your BFF. Additionally, try to limit heat until hair is stable. 5. Add 1-2 T collagen daily: Mixing 1-2 tablespoons of this easily digested and tasteless powder daily in a smoothie, cereal, or pretty much anything hot or cold will promote hair growth. It will also help those darn hormones balance, which is so important for getting hair back to normal. We love and use this brand daily at our house (see discount note below). 6. Administer coffee enemas: These will detox and restore the liver, which has been so busy filtering out all those hormones after having a baby. This is going to again help hormones regulate by strengthening the liver so it can do it’s job optimally. Enemas will also help with energy levels and provide some insomnia relief as well. Special Note: These tips are all given assuming you’re already eating a well-rounded diet and properly hydrated. If you’re unsure that’s the case or need a tune-up, I’m here to help. Simply click the ‘Work with Me’ tab above. If it’s been a year and there’s no improvement, please seek the advice of your MD. It’s possible there’s an iron deficiency (anemia) present or thyroid dysfunction is occurring. 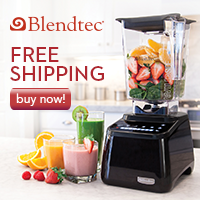 Save 10% on Perfect Supplements listed above by entering code RNL at checkout. Shop and save bundles here. I KNEW HORMONES HAD TO BE RELATED TO ALL MY HAIR LOSS…BUT MINE NEVER WENT AWAY!! PREGNANCY ALSO STARTED LOADS OF NEW SKIN MOLES AND HEMANGIOMAS….WHICH ALSO NEVER STOPPED. HAVING BABIES DEFINITELY CAN CHANGE YOUR BODY! Sorry for the cap locks!! Just noticed! Wow Tessa! I’ve never heard of that happening. I consulted a few hair dressers when doing my research because I thought they may have some very different insight. Yes, babies make everything crazy. Hormone-related hair loss can feel devastating, thanks for the tips! It’s so frustrating, especially when you’re exhausted and already dealing with so much. I’m definitely pinning this to reread later, so many good tips for healthy hair even if you haven’t just had a baby! Great tips here. Thanks for posting. Kids definitely changed my body and chemistry. Loved having thick hair during pregnancy. Uh, thick pregnant hair is the best. My postpartum hair is now better than when I was pregnant! Such a great article, Melissa! I’m sure this is a concerning situation. It’s nice that you explained it so well. XO. That means so much Carrie. I am so glad you think so! So many great suggestions here; thank you! Love your insights, knowledge and the product links! I remember this happening to me, it just falling out in big chunks in the shower. Some good tips for people experiencing this. Ugh, the worst! Thanks Jo! Two of my friends are giving birth to their first bone child soon. I will share this article with them. Thanks so much ! Great tips! I know a lot of women, like my sister lost a ton of hair…. I think I did too but I have so much I didnt really notice. I do take collagen daily for hair health and it works! That’s so awesome you didn’t lose much and use collagen! Did you take biosil while breastfeeding? I can’t find info on this and am losing crazy amounts of hair! This is my third baby. Hey Leila! Yes, almost the entire time! Next Next post: Do Beauty Products Cause PMS?